So how does the garden grow? Very well, today, since we got over an inch of rain in the morning. In central Indiana, we've been fortunate with the rain so far this year, generally getting some when we need it. I was concerned over the weekend that things were drying out a bit, but not to fear, it rained! I've received a few questions about the raised bed vegetable garden. Currently I have planted eight 4' x 8' beds, three 2' x 8' beds, three 4' x 4' beds, and two 2' x 4' beds, and one 4' x 6' bed plus I have a three bin compost area in the corner. If I did the math correctly, that is 392 square feet planted. There is one 4' x 4' bed in the middle, with a bench in front of it. This has a dwarf apple tree in the center, and some thyme and sage around it. I planted zucchini squash (green and yellow) in one of the other 4' x 4' beds and grape tomatoes (variety 'Sugary') in the other bed. In the three 2' x 8' beds along the back side of the garden, I planted zinnias and sunflowers. The zinnias are starting to bloom and I am also seeing a few sunflower buds, though I am hoping they actually bloom a little later, because the variety is 'Autumn Beauty'. In the one 2' x 6' bed, I planted three blueberry shrubs this spring, variety 'Sunshine Blue'. They are still fairly small, so I added some gladiolas for this year, just because I ordered some from a friend for a fundraiser. Now the 4' x 8' beds. I planted one bed with strawberries this year, variety is 'Ever Red'. I had another variety of strawberries planted in another bed for a few years, but I didn't know the variety and they were lousy, so now they are compost. The rest of these beds contain green beans, peppers, tomatoes, cucumbers, and corn. I also had planted the lettuce and onions and peas in one bed, and it now contains a rather pathetic looking 2nd crop of green beans, half eaten by rabbits. Bean varieties include Tenderpick Bush Snap, Contender, and Kentucky Wonder Pole Bean. Pepper varieties include Anaheim, Sweet Banana, Valencia Hybrid, Golden Summer Hybrid, California Wonder, and Jalapeno. Tomato varieties other than Sugary inclde Super Beefsteak, Big Boy, Early Girl, Glory, Brandywine and German Johnson. Cucumbers are Bush Champion and Picklebush. Corn variety is 'Mirai', a supersweet, which is just starting to tassel. I started the peppers and tomatoes from seeds, and planted everything else directly as seed in the garden. 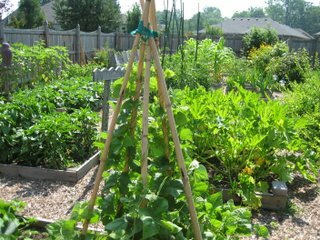 I do rotate my crops as best I can from year to year, which is a good gardening/farming practice. I don't generally sow any cover crops over the winter, but do top dress the beds with old soil from containers I've had on the front porch and back patio and any good compost I get from my compost bins. I highly recommend this method of gardening, as you can easily weed one of the beds in a few minutes, and you don't have to get out the roto tiller and till up the whole garden in the spring. This means you don't have to wait for the perfect conditions to till and can generally plant earlier in the spring. 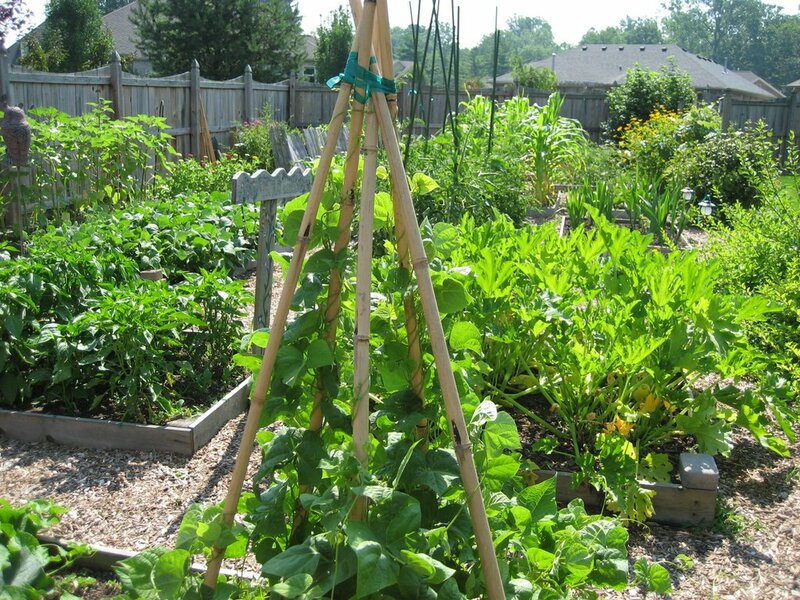 Also, it is very easy to cover one or two beds with garden cloth to keep out the critters! That's it, that's the entire vegetable garden. What a beautiful garden! I also do raised beds, and like you I find the weeding to be much easier. Plus, it's much less daunting to tell yourself you're just going to weed one raised bed rather than a huge expanse. This is darned impressive! My guess wasn't far off the mark - we only have about 125 square feet, packed solid with tomatoes and peppers. My husband won't give up space to anything else. Wow -- this is a really impressive set-up! Gives me lots to think about for future years. I have one 4x16 raise bed for vegetables. It is a lot easier to weed than regular gardens and warms up faster in the spring.